There is dry land training being offered this year. This is open to any kids over 10 who would like to get fit, and ready for the season. It will start early Sept. 2013. The trainer is Rob Dixon, located at 885 Jet Ave, unit 2. We are getting an early start this year to allow the athletes more time to get ready for snow. Stay tuned for more details. 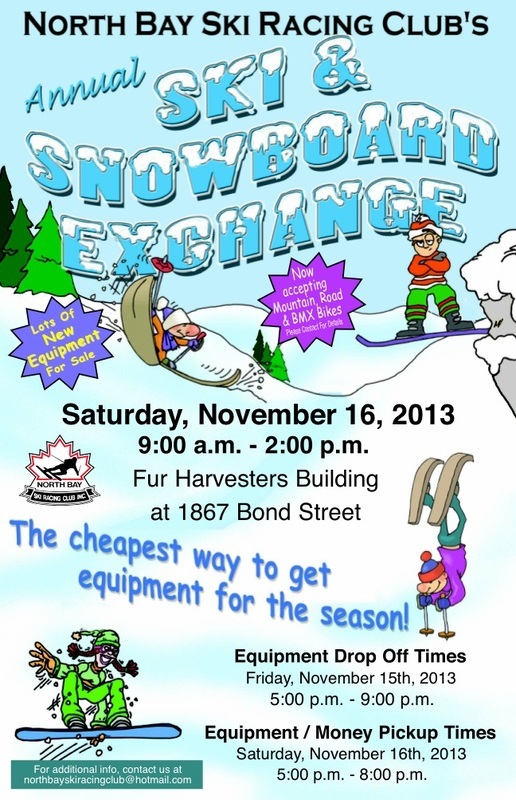 The North Bay Ski & Snowboard exchange will be held on Saturday, Nov. 16, 2013 from 9 am to 2 pm at the Fur Harvesters on Bond St. Drop off for equipment to be sold will be on Friday, Nov. 17, 2013 from 5 pm to 9 pm. Mark these dates on your calendar. Bring in your old gear and upgrade and or upsize. This is a great venue to outfit your entire family. It is also a fun day for the ski racers, and a very important fundraising event for our club. For anyone who has helped out in the past, you know it is a very fun day for everyone!! Volunteers are very needed for these dates. Mike is a former NBSRC athlete who was born and raised in North Bay, ON. With all of Mike's hard work and determination with the Ontario team and the Canadian prospect team, Mike has now graduated to the Canadian National Para Team. Mike has cerebral palsy and competes in the standing category. The Club would like to wish Mike the best of luck on his new journey in the ski racing world!! North Bay Ski Racing Club is holding a fundraiser dinner at BOSTON PIZZA, Sunday Jan, 27th from 4:00pm to 7:30pm. 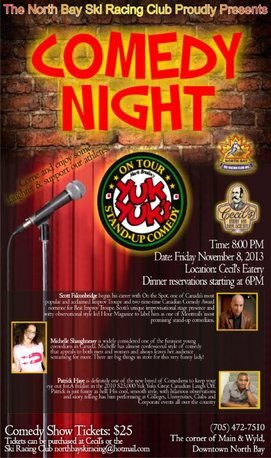 10% of ALL sales in this time frame will be donated to the club by BOSTON PIZZA. Please make your reservation at northbayskiracingclub@hotmail.com. Reservations are required. Come out, ask questions, meet some coaches, meet some other parents, meet some ski racers. Hope to see you all there!! This year we will be offering a one day program for kids aged 5-6. It will happen on Saturdays, at a cost of 275.00. This is a great alternative to committing to an entire weekend, and the price point is very reasonable for the entire season. This program will be offered only if enough kids sign up, so pass on the info to friends, family and co workers. U12/U10 (5-11) Pre-Christmas camp during the break. There is dry land training being offered this year. This is also open to any kids over 10, who would like to get fit, and ready for the season. It will start on Oct 10th. The trainer is Rob Dixon, located at 885 Jet Ave, unit 2. It will run Mon and Wed at 4pm, for 6 weeks at a cost of 145.00 per athlete. On Oct 13th, from 9am-1pm there is a volunteer clean up day at Laurentian ski hill. Looking for anyone, and everyone to come out and help get the ski hill cleaned up and ready for another season of great skiing. Don't forget that the last day to get your discounted ski pass from Laurentian ski hill is Nov 3rd. at northbayskiracingclub@hotmail.com . Reservations are required. Come out, ask questions, meet some coaches, meet some other parents, meet some ski racers. Hope to see you all there!! The North Bay Ski & Snowboard exchange will be held on Saturday Nov 17, 2012 from 9 am to 2 pm at the Fur Harvesters on Bond St. Drop off for equipment to be sold will be on Friday Nov 16, 2012 from 5 pm to 9 pm. Mark these dates on your calendar. Bring in your old gear and upgrade and or upsize. This is a great venue to outfit your entire family. Its also a fun day for the ski racers, and a very important fundraising event for our club. For anyone who has helped out in the past, you know its a very fun day, for everyone!! Volunteers are very needed for these dates during these time frames.